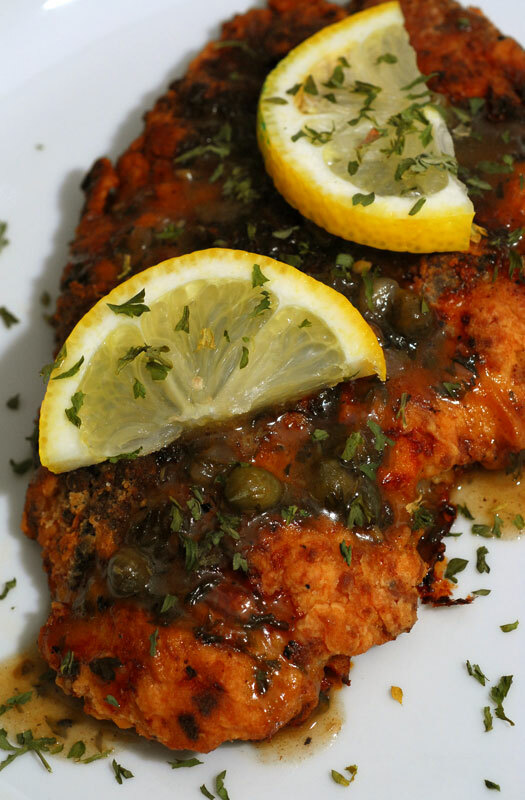 ***Chicken Piccata has always been one of my favorite classic chicken dishes. When prepared perfectly, it becomes a symphony of lemony goodness! Ina Garten is without a doubt one of my favorite Food Network personalities, and she does it again with this dish. Plus, most of us can get bored with cooking chicken all the time...I know I do! So, this dinner is a great way to spice things up a bit. One of the things that I love most about this recipe is how the chicken is prepared. First, it's seared to a golden brown on both sides in a skillet, and then it finishes cooking in the oven. This ensures that the outside of the chicken is crunchy, while the inside is juicy...Perfect! The one thing that I changed in Ina's recipe is the addition of a tablespoon or two of capers. 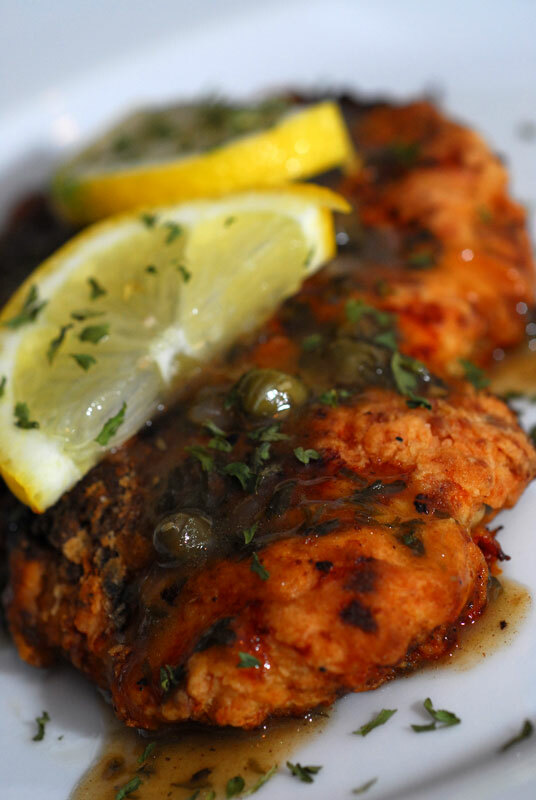 Chicken Piccata just isn't Chicken Piccata without capers, if you ask me! 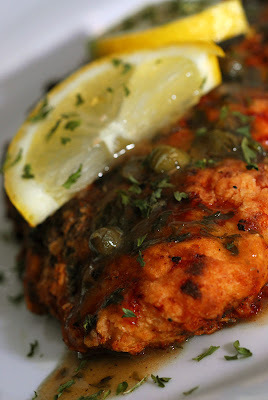 Be sure to taste the sauce before serving...It's really easy to let the flavors get out of control with this dish...Lemons, capers, and wine are all strong flavors, and you don't want it to be too over-powering. Preheat the oven to 400 degrees F. Line a sheet pan with parchment paper. Place each chicken breast between 2 sheets of parchment paper or plastic wrap and pound out to 1/4-inch thick. Sprinkle both sides with salt and pepper. Mix the flour, 1/2 teaspoon salt, and 1/4 teaspoon of pepper in a shallow plate. In a second plate, beat the egg and 1/2 tablespoon of water together. Place the bread crumbs on a third plate. Dip each chicken breast first in the flour, shake off the excess, and then dip in the egg and bread crumb mixtures. Heat 1 tablespoon of olive oil in a large saute pan over medium to medium-low heat. Add the chicken breasts and cook for 2 minutes on each side, until browned. Place them on the sheet pan and allow them to bake for 5 to 10 minutes while you make the sauce. For the sauce, wipe out the saute pan with a dry paper towel. Over medium heat, melt 1 tablespoon of the butter and then add the lemon juice, wine, the reserved lemon halves, 1/2 teaspoon salt, and 1/4 teaspoon pepper. Boil over high heat until reduced in half, about 2 minutes. Off the heat, add the remaining 2 tablespoons of butter and swirl to combine. Discard the lemon halves and serve 1 chicken breast on each plate. Spoon on the sauce and serve with a slice of lemon and a sprinkling of fresh parsley.